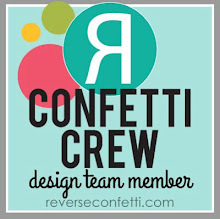 For my first card, I started by first die cutting a piece of black cardstock with the Big Stripes Cover Panel Confetti Cuts, then adhering the die cut to a white card base. I then used the Jam Jar Confetti Cuts on yellow and white CS to create the little jam jar (isn't it adorable?! ), and adhered the die cuts to the card front using foam tape. I then stamped one of the sentiments from In a Jam in black ink onto white paper, heat embossed it with clear embossing powder, then cut it out using the coordinating dies. The jar label sentiment was then adhered to the card front with foam tape, and yellow enamel dots were added for interest. For my second card, I started by first cutting a piece of light gray striped patterned paper, and adhering it to a white card base. 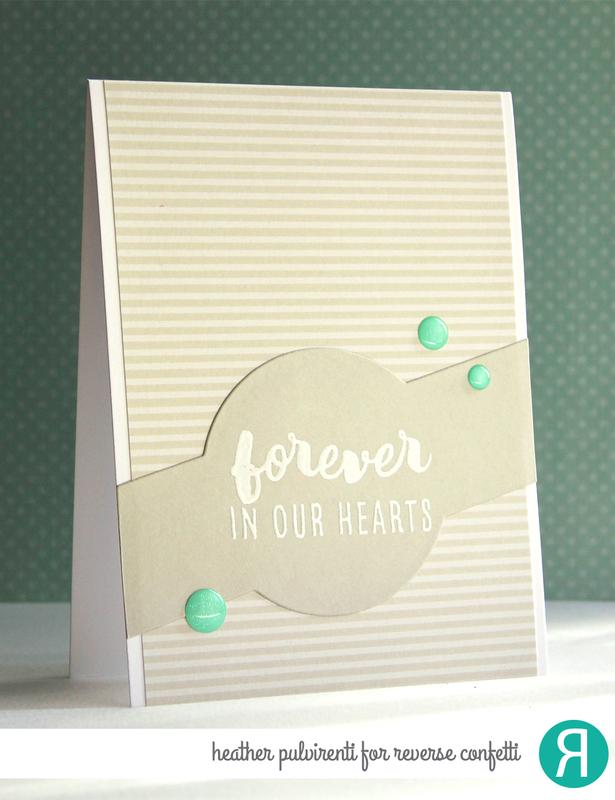 Next, I used the Circle Band Confetti Cuts on a piece of light gray cardstock, then stamped it with one of the sentiments from Forever in our Hearts. The sentiment was then heat embossed with white powder before adhering the layer to the card base. To finish up, I embellished with aqua enamel dots. 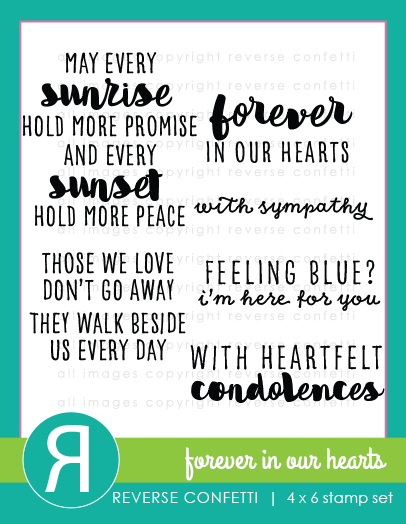 Sympathy cards are one of the hardest cards to make, but I love this sweet sentiment! 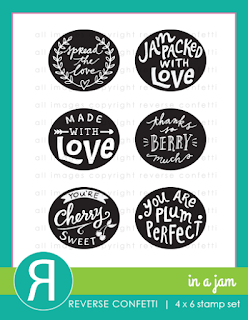 Fablous cards and I love the jam jar!!! Two fabulous cards with different looks, that is so cool how versatile RC is! Love the yellow and black!! Love the new jam jar die and stamps!! Both CAS cards but wonderful with neutrals and pops of color! The jam jars are just too cute! 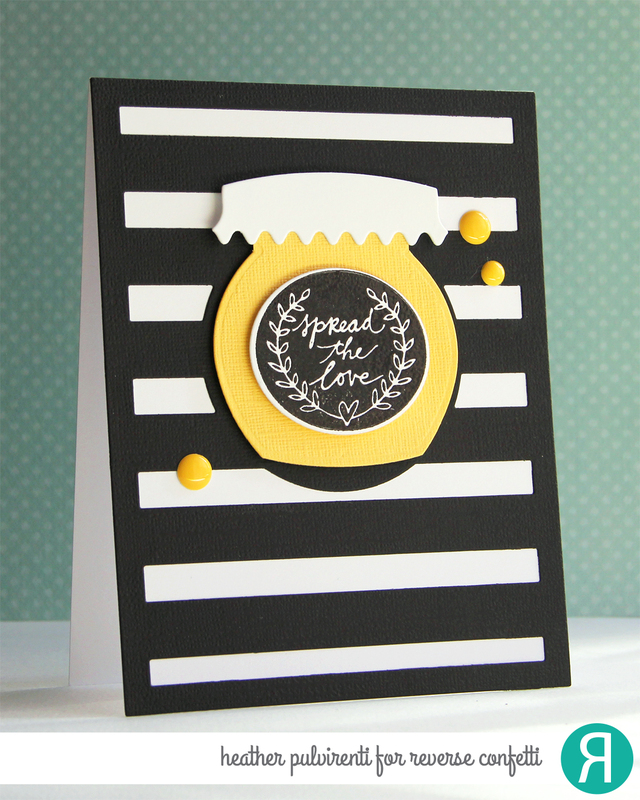 Love the bold black and yellow combination and the soft simplicity of your second card! 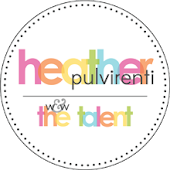 Both of your creations are so pretty Heather - your style is fabulous! Love the cards...the Jam Jar is adorable! Great cards! Love the jam jar confetti cuts, so clever! Love the dramatic look with you color choices! Love the bold stripes on the first card. The second is sleek and simple and so pretty. The muted colors are great. Pretty cards! That jam jar is adorable! Love the label, and b&w stripes for the background! Pretty card with the circle band die also! I love your jam jar in yellow! It reminds me of honey or mustard, which are both amazing condiments as well! Very cute! 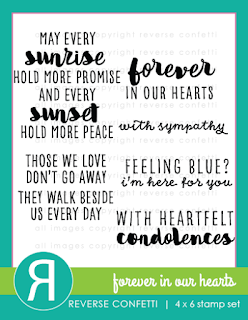 I agree - sympathy cards are hard.😔 The sentiments in Forever in Our Hearts are really lovely, they will help convey a beautiful, caring message. Great cards as always! The Jam Jar die is so cute! Love the tone one tone card. Great cards, the black and yellow is very striking and the second very soothing and peaceful! Fantastic cards, love the Jam Jar die!! Gah!!! So cute! Love the black and yellow combo! Love the pop of colour with the jam jar and the soft soothing nature of the last. Great cards. Love the colors on your first card and your second is calming. Thanks for sharing your ideas with us. 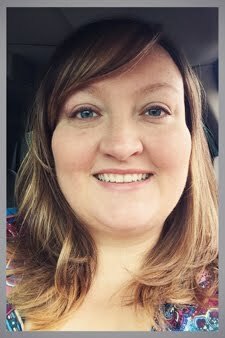 Those jars are so fun and I love the colors on your second card! 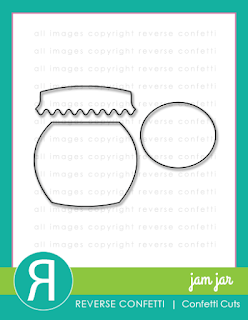 Loving your jam jar card! Lovely cards! Love the jam set. Love the black, yellow and white color combo. Could see a bee added to that easily. Can't wait for the rest of the release. Wonderful cards! 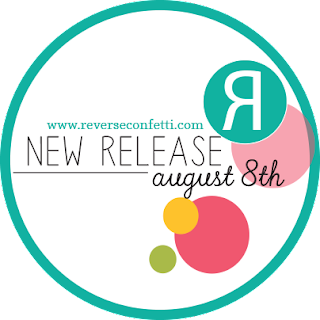 I am loving this release and the gorgeous inspiration you are sharing! Beautiful cards! I love the color combos! These are both lovely and elegant! Great cards. Love the dramatic colors on the first one. Gorgeous, bold and CAS!! Love the crisp and graphic look of your first card especially! Great cards. Love the black and yellow color combo. Wonderful CAS cards, the first one is so striking! Very nice, I like them! Spread the love is so cute- love the color combo- and the condolences card so elegant. Thanks for inspiring! What great match ups with stamps and dies! Your cards are perfection!